Celebrity impressions for bits, calls, imaging and more! "You are so damn good! Thank you for Making Our Show Great Again!!" Mojo, host of "Mojo in the Morning"
"Eric, if I had your voice, I could really go places." "Eric! Love your Trump…been one of my favourites on the station for a long time. New show, long haul ahead… glad to have you have you on board. But let’s make one thing clear...I never, ever want to hear your real voice. "I’ve never worked with someone with so much talent. Eric’s impressions are dead-on! We’ve fooled the best and the listeners loved it! And even better than Eric’s talents, he is an awesome guy to work with. A total pro and very dependable!!" From 2016-2018 I was on regularly in Sydney, Australia with the Triple M "Grill Team" morning show as Trump. On this particular day, John Travolta was in the news for the fact that he was retiring his personal Boeing 707 jet and donating it to an Aeronautical Museum there. The show asked if I would call up as Travolta and prank Gus Worland, one of the co-hosts--with everyone else in on the joke, including the listeners. Lots of fun. "Eric does the best Trump in the business." 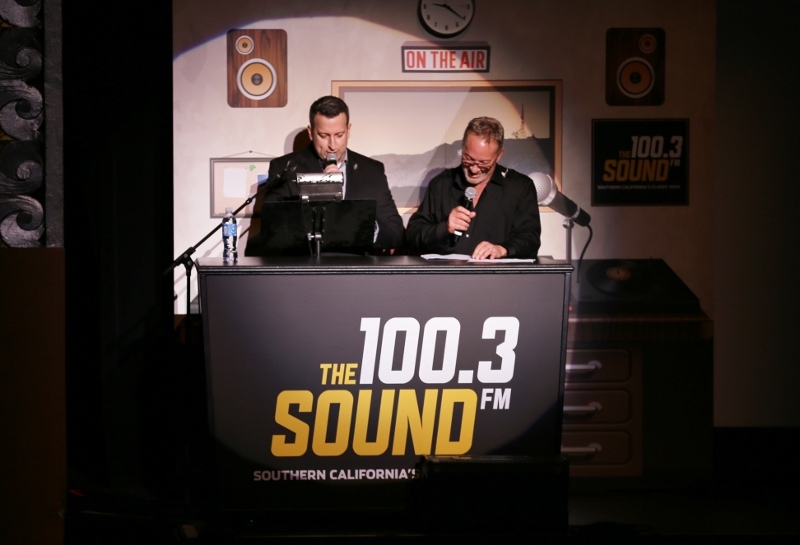 I had the honor and pleasure of working with radio god Mark Thompson, (formerly of the "Mark and Brian) for a stint on 100.3 The Sound's "Mark in the Morning". And I continue to do call-ins with Gina Grad & Andy Chanley on the Classic Rock Morning Show. "Well, I didn't know you also had the Former President on your program!" "We love Eric's voice work! His versatility and range is the best I've ever heard. Don't miss the chance to work with this amazing talent!" "Eric Harthen backed into my car and did $1,200 worth of damage. Two weeks later, he cut a huge slice out of a fresh birthday cake I brought in for our boss before we could put the candles on it. Last week, he sent me a text of a swimsuit model and my wife caught me looking at the photo. He also does incredible voice-overs and impressions." "Eric puts on his characters like a favorite t-shirt. He's a quick wit who writes in real time and brings his best to everything he does, solo or ensemble. A first call guy." 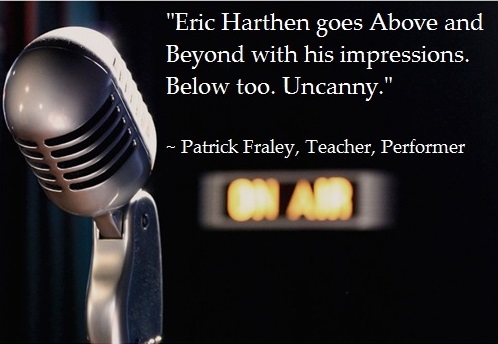 "I worked with Eric Harthen for 2 years and was dazzled daily by his voice talents. I especially loved how he could come up with an impression of someone in the news THAT DAY...and it was excellent. Ask him to do his Senator Larry Craig for you sometime." - Mark Mohelnitzky - Supervising Producer - "On Air with Ryan Seacrest"